Master Harvey began down the path of martial arts in 1991 at the age of 23 after a lengthy stint as a dancer. She had already graduated from the Penn State University with a major in Therapeutic Recreation and a minor in Dance. Ms. Harvey has been employed as a child development specialist, job coach, and an intensive case manager for children with mental health diagnosis. In addition to her responsibilities as Chief Instructor at Imperial Dragon Tang Soo Do Karate School she also teaches Little Dragons at the River Valley Tang Soo Do Academy. 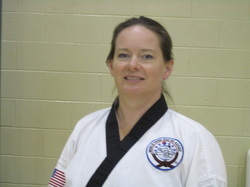 Master Harvey was awarded her Sah Dan and Masters rank in March of 2011. She is a gold member in The World Tang Soo Do Association. 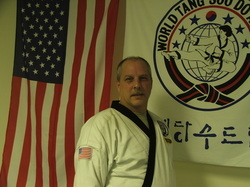 _ Mr. James K. Johnson is a certified second degree Black Belt instructor in the World Tang Soo Do Association. He began his training at Imperial Dragon Tang Soo Do karate School in October 2000. Under the tutelage of Mr. John Casuccio and later Master Julia Harvey, he achieved the rank of Cho Dan (1st degree Black Belt) in July 2007. He then achieved the rank of E Dan (2nd degree Black Belt) in July 2010. Mr. Johnson achieved his Instructor Trainee status as a Cho Dan Bo in 2006. Now a fully certified instructor at Imperial Dragon TSDKS he strives to teach students the traditional art of Tang Soo Do as it was taught to him. Mr. Johnson is a proud member of the United States Air Force reserves at the 911th Airlift Wing in Pittsburgh, PA.